Laminate flooring is beautiful, durable, cost-effective, and one of the easiest types of flooring to install. A new laminate floor can typically be installed in just a weekend with a moderate level of difficulty. Installing the floor yourself can save on installation costs, which typically range from $2-$7 per ft2. You can find how much laminate flooring costs to install in your area. If you’re installing a new laminate floor you need to make sure you have the following materials ready. You can use our flooring calculator to estimate how much laminate you’ll need. Use our trim calculator to estimate the amount of quarter round trim needed. You will need the following tools to install a laminate floor. Before a laminate floor can be installed the sub floor needs to be perfectly flat and clean. Refer to the manufacturer of your floor to find if your existing subfloor will work with your new floor. In most cases laminate can be installed over other types of flooring, except for carpet. Remove staples, nails, or anything else that could obstruct the new floor installation. The floor, should be flat with no more than 1/8″ height differences over 4′. Use a long level or flat board to determine if the floor has any peaks or valleys that would need to be filled. Self-leveling compound can be used over concrete or vinyl, but if the existing subfloor is wood then I have found that a combination of roofing felt, shingles, or vinyl self-adhesive tiles can be used to fill in any valleys. The subfloor must be clean of any debris, make sure you sweep and use a vacuum to clean up all of the dust and larger particles. New laminate typically needs to be acclimated to the humidity of your home. Most manufacturers recommend letting the new floor sit in the home for several days prior to installation to minimize the amount of expansion and contraction that occurs after installation. the door casing needs to be cut to allow the new flooring to slide underneath. Use a piece of scrap flooring to set the level and use an undercut saw to cut the door casing to the height of the floor so that the floor slides evenly. If you have a lot of doors, consider getting an oscillating saw or powered door casing saw which will make the process go a lot faster. You can usually install a new laminate floor without removing the baseboards, but if you can remove the baseboards it will make the project much easier and gives you more margin for error along the edges of the floor. If your floor is being installed over concrete then most manufacturers require using a moisture barrier to prevent moisture seeping from the concrete ruining the floor. Concrete is porous and moisture comes from below the home through the concrete. A moisture barrier keeps this moisture from absorbing into the flooring. Lay the moisture barrier across the floor and up the wall 2″. Any seems should be overlapping by 6″ and secured with tape. The next step is to install an underlayment for the floor. Refer to the manufacturer’s recommendation for the right underlayment for the flooring. Also note that some floor products have an attached underlayment, so this step may not be required. Lay the underlayment on the floor and leave the edges flush with the walls. If there are seams they should not overlap as this would cause a bump in the floor. Secure the seams with tape so they don’t shift. The first row of laminate is the most important row. It must be perfectly straight and needs to be cut to a width that will allow the last row to be wide enough to install. Measure the width of the room to find how many rows of flooring there are. Make sure to cut the first row so that the last row will be at least 3″ thick, making sure to account for 3/8″ gap along all edges of the floor. Use a table saw to make the cut. Using a chalk line lay out a straight line that the first row can be aligned to. Lay out spacers along the first wall to ensure a minimum 3/8″ gap along the wall. Be sure the first row of floor is aligned to the chalk line, not the wall. If the wall is uneven some shims may be needed to keep it straight. 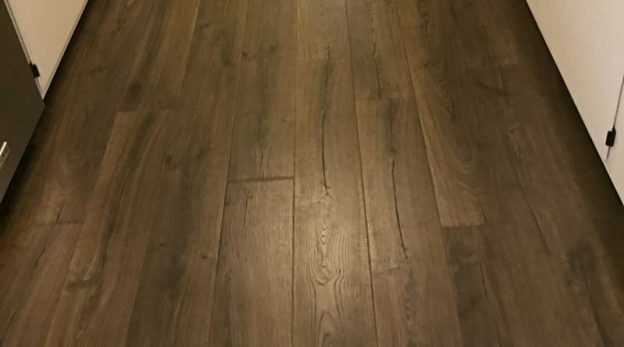 Spacers can be purchased with the flooring, but I like to use scrap pieces of floor as the spacers since they are typically 3/8″ thick, free, and are in good supply when working on the floor. Cut the first and last pieces in each row using a miter saw or a circular saw. Cut the pieces so that each piece is offset and that there are no joints within 6″ of each other within 4 rows. Make sure to add spacers to the ends of the rows to prevent them from shifting. Snap each piece together following the manufacturer’s instructions. I have found it easiest to align the piece and click the long joint together, then use a pull bar and tapping block to slide the piece the long way until it meets the end of another piece. You can purchase a tapping block, but I like to take a scrap piece of floor and cut the tongue of one of the click joints using a table saw so that the click part is removed, but that the top and bottom of the joint still make contact. This prevents ruining the joint when tapping and doesn’t cost anything. To install around door jambs use a jig-saw to cut the floor so that it can slide under the jamb and has a little space between the end and the stud behind the door casing so that the floor can expand. This is probably the trickiest part. Continue to install the entire floor, cutting as needed, ensuring there is a 3/8″ gap areound the entire floor perimeter. The final step to installing a floor is to install all of the trim. Re-install the baseboard trim if it was removed. Install thresholds, floor reducers, and stair bullnose mouldings as needed. These pieces can usually be purchased where the floor is purchased. The final step is to install the quarter round moulding to cover the 3/8″ gap around the perimeter of the floor. You can use a hammer and nails, but an air compressor and nail gun will make the trim installation much easier.